Mama Nash: Four More Years! Today I hear my husband say in his best Arnold voice, "FOUR! MORE! YEARS!" Do you remember that? It's from the 2004 Republican National Convention when Arnold Schwarzenegger was campaigning for G Dubs. That night Brian called everyone in his family and, in his spot-on Arnold impression, started screaming into the phone, "FOUR! MORE! YEARS!" That joke came back to haunt me today as we celebrate our fourth wedding anniversary. I wrote an ode for Brian that is more funny than sentimental (which in itself describes our relationship to a T) and I was going to post it for you here but when I reread it I realized that every single line is an inside joke and wouldn't get any punch from you, my readers. 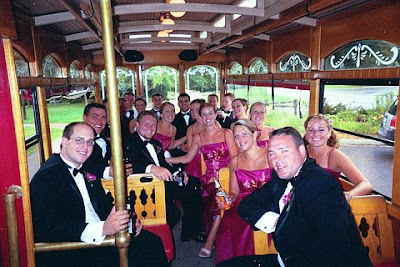 So you'll have to settle for a picture of our wedding party. And what a party it was! Happy being married to us! If you squint real hard you can see Brian and me on the left in the way back of the trolley.